I am once again indebted to my Icelandic colleague Unnur for this last post of 2013. 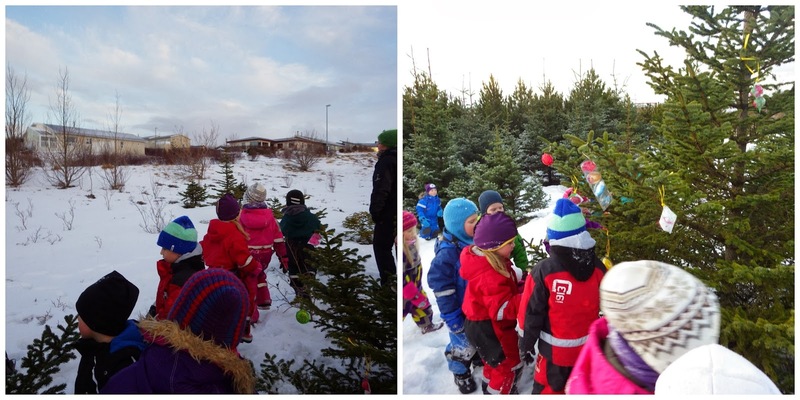 Here Unnur is good enough to share the adventures of her class as they enjoyed their final trip to the forest area near their school before the Christmas break. 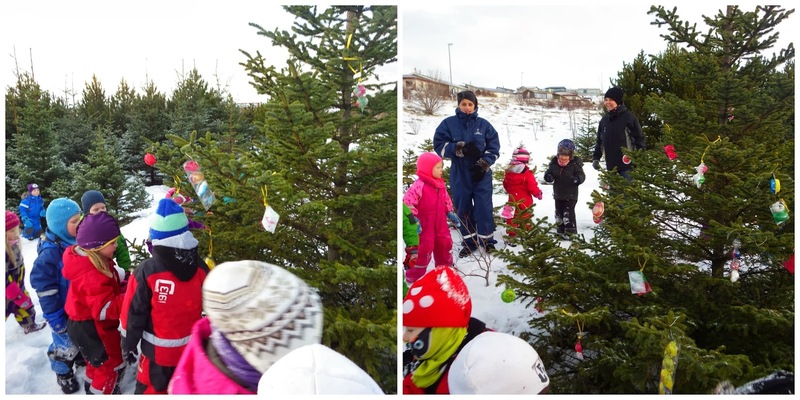 I was lucky enough to spend an afternoon with Unnur & her class in this area in October & it's lovely to see it covered in snow & being incorporated into their Christmas celebrations. "The last trip to the woods before Christmas was full of mystery, the ground was covered with snow so it was easy to make it an exciting trip. While the children were at school watching a Christmas play 2 teachers sneaked off to decorate a tree & leave some footsteps in the snow! At 12.00 about 30 children & 5 teachers headed into the woods, the children had been told it was going to be a different trip but that they would have to wait & see why. 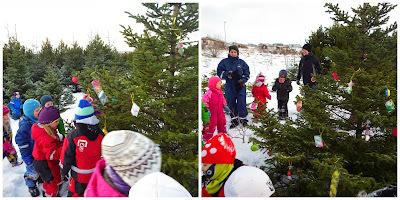 We headed to a part of the woods the children call 'Wolf Forest' and it wasn't too long until something interesting was discovered on one of the trees - it was a Christmas ornament. 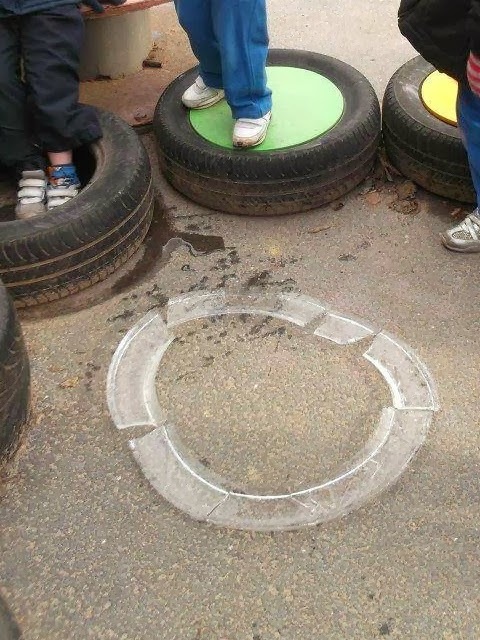 Someone said 'Hey, we did that at school, why is it here in the woods?' A big mystery!! 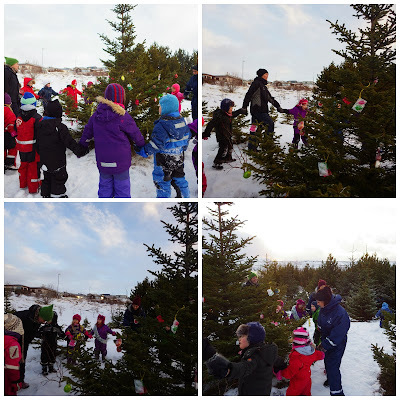 Then we had some hot chocolate & Christmas cookies before heading back to school the children played a little in the trees that are a favourite part of Wolf Forest.And so ended our little adventure in the woods for Christmas & 2013." HAPPY NEW YEAR FROM US IN LEIKSKOLINN STEKKJARAS. I am hoping that my school will continue their partnership with Stekkjaras in 2014 through an Erasmus Plus school partnership. Why go outside first thing? For the past 7 years my class has started the day from outside, to us it now the norm & in fact in September when we are settling in & start off inside, it feels really alien to all of the staff & we can't wait until it is about the 3rd or 4th day & we can start going outside first thing again. Why do we go outside first thing? Historically it all started 7 years ago when I had a class of 19 boys & 7 girls, not to stereotype but it was a very noisy, active class. One morning about 2 weeks in one little boy was having a hard time leaving his mum, English was not his first language & we had noticed he was much happier outside on the bikes. So I suggested to the main nursery assistant that we open the doors & go outside, he ran out & after about 5 minutes let his mum go home. 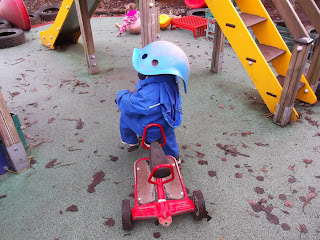 We decided to try going outside first for a week to see if it made parting from parents/carers any easier. Guess what? Of course it did, there are a lot more 'distractions' outside, children want to run off to the slide, go on a bike, play with the water etc. 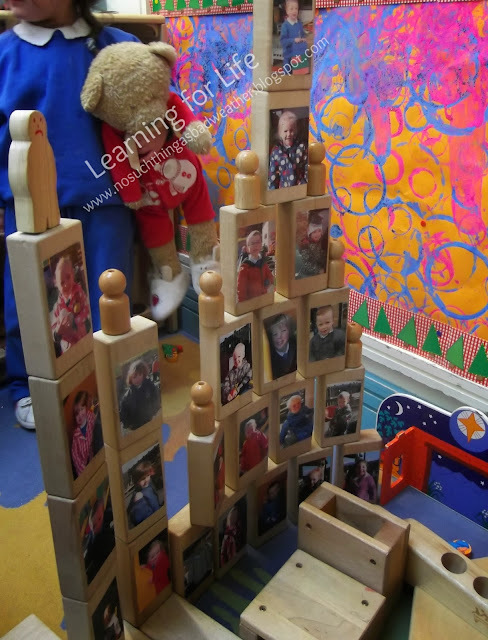 But we have also found that when inside the classroom you have 1 or 2 parents staying around it is too many adults in the room & you really notice them whereas outside an extra adult is absorbed into the space & makes very little difference. It can be daunting for any child to have lots of adults standing around in the classroom but outside sometimes (at settling in time) we could have up to 6 extra adults & it makes little or no impact. 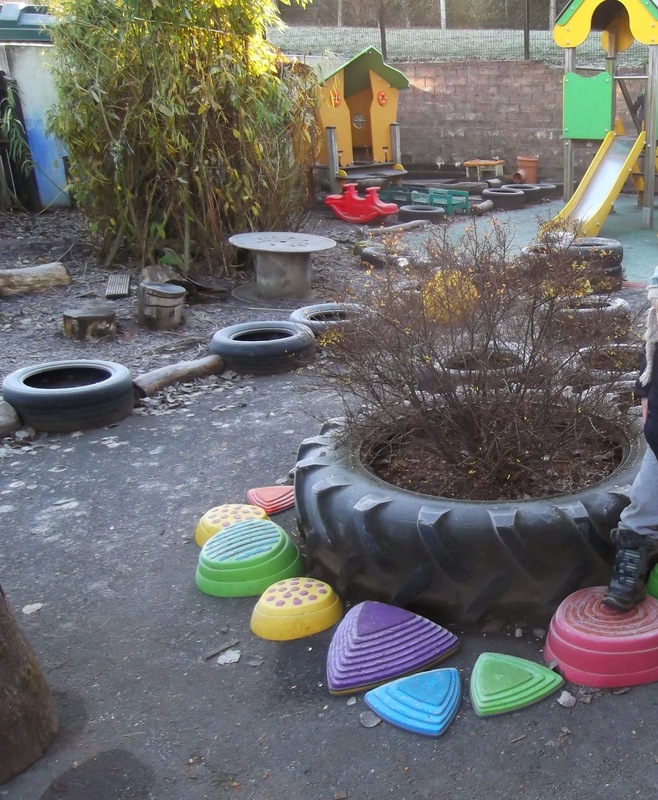 A parent can withdraw to some of the many seating areas in the playground & allow their child to venture off to explore the area much easier than they can inside. The bikes are always a draw & an opportunity to part easily from a parent. From a practical point of view, it is much easier to watch the door when outside. For the 10 minutes that the main front door is open all it takes is for one adult to stand near the entrance out to the playground & then they can keep an eye on who is coming in or going out again. After 10 minutes we lock the main door & parents leave by the side gate in the playground & this is also how children arrive after 9.00. Some children will stand for a while taking all the choices in before venturing off to play outside. 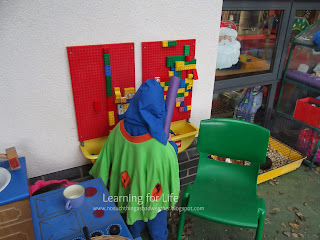 Sometimes people ask 'Don't the children want to play with the toys on the way through the classroom to the playground?' and the answer is yes, sometimes but mostly no, they just know to walk through the room & go outside. 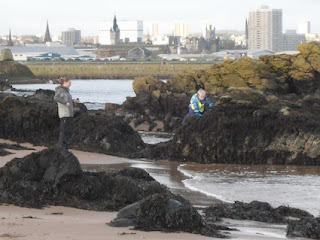 As I said earlier we try to introduce the concept of going outside first from about the 3rd day & it is amazing how quickly the children & parents accept this routine. 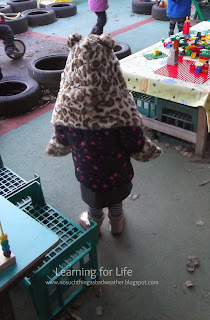 Of course, best of all from a staff point of view - the children come into school with their coats already on! Only someone who has spent ages with 26-27 3-4 year olds putting on coats to go outside can know how great this aspect of the day is!! 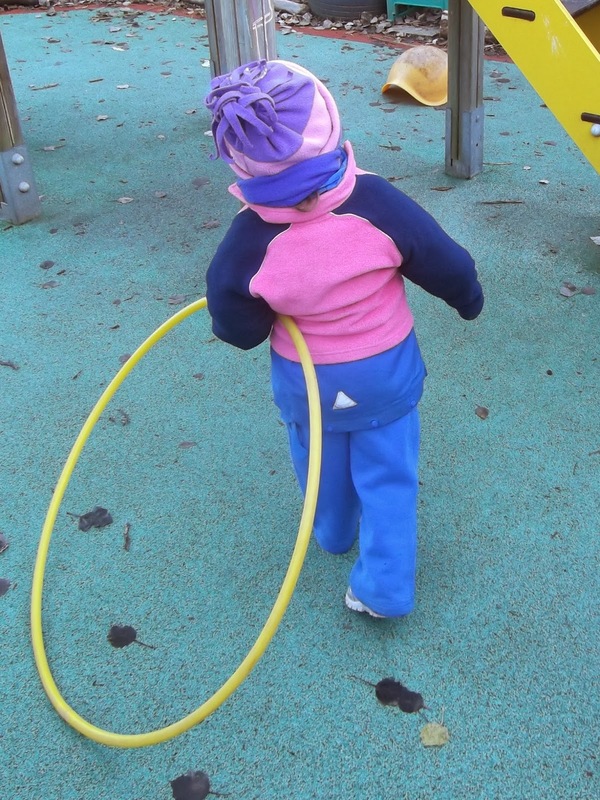 If we are going outside again after lunch, it is usually a more gradual event than the whole class getting ready at the same time, with 5-6 children at a time getting coats on & then heading outside. However, the best aspect of this part of our routine is that when we do come inside, the children are much more ready for more settled play. 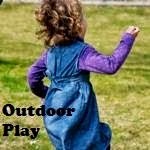 This is the part that most visitors notice & comment on & it's not really any surprise that is the children have been outside for at least 60 minutes where they have been able to run, climb and shout that they are then more able to sit at quieter play when they come inside. 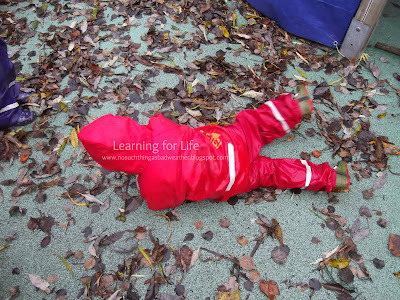 Having had the chance to run about engaged in more strenuous play outdoors, the children are 'ready' for more settled play when they come inside. The fact that we go outside first thing, is something I stress at the parents information evening in the June before the children start nursery. It is also emphasised that this will happen every day no matter what the weather. By now a lot of our parents have already had children through the nursery in the past 7 years so they know the routine & more importantly they also realise that the system works. 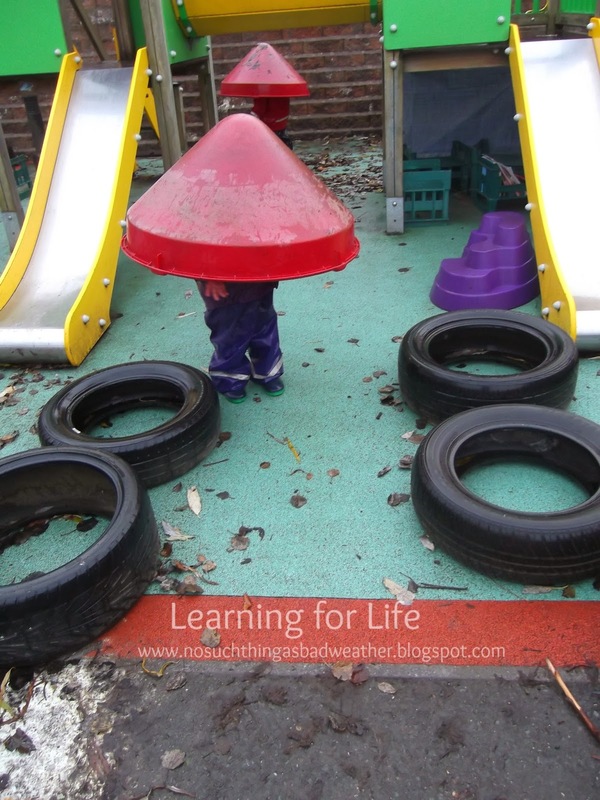 But there are always new parents who are a little taken aback on the first very dark or wet morning when they realise that we do really mean it when we say we are outside everyday. I didn't follow the traditional route to becoming a teacher, I was 29 before I went back to retrain & had spent some time dabbling in student politics, marketing, office management & proof reading. However a series of events conspired to get me into a nursery class in 2006. 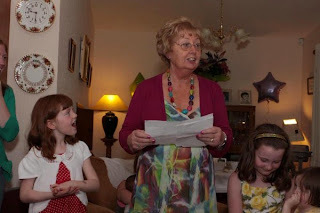 My mum was a teacher and in fact was a nursery principal when she retired (early I better add) in 2006. Her colleague who was acting principal at the time needed a nursery assistant & I had recently lost my job. I am indebted to Christine for having the belief in me to allow me come into her class & be her assistant. Whether she thought I would be a natural merely because my mum was such a great teacher or she was just so desperate she figured anyone with a pulse would do - I got the chance to work in a nursery classroom in February 2006 for a few months. (It actually turned out to be 18 months). Ice is never just ice when there are children around! "It's a dinosaur egg"
I never forget that first day about an hour in, I was sitting at the water tray with some children playing with plastic fish & a pirate ship & I clearly remember thinking 'This is the best job ever'! I couldn't believe how much fun it was & I discovered I actually loved being around 3 & 4 year olds. All those years of hearing relatives say "Oh I bet you'll be a teacher like your mum" came back to me. I had been adamant for years that as I was nothing like my mum, of course I wasn't going to be a teacher! So imagine my surprise when I actually found out that I was very like my mum & in fact would be lucky to be half the teacher she was. My mum - I only wish I had had the chance to work with her, as I now know she was one of the finest nursery teachers ever. It took me a further 2.5 years before I was accepted on the Post Graduate Certificate in Education (PGCE) in Primary Education. I knew I wanted to be a nursery teacher but at that time there was no early years PGCE so I had to put my year in learning to be a primary teacher. I graduated in August 2000 & finally had that elusive piece of paper that allowed me to go look for a job as a teacher. I was fortunate to get a maternity cover in the same nursery where I had got a break as a nursery assistant (so Christine, by now the Principal, had a lot of faith in me) & that first year as a teacher I taught nursery, special needs Primary 3. I enjoyed teaching in the primary schools but my heart lay in nursery. I was so lucky the following October to begin a temporary contract as nursery teacher in my current school. I never, ever thought I would still be there 12 years later! I truly believe I have the best job in the world. I get to teach the most enthusiastic students in the school system. Everyday I hear laughter, get hugs & told how great I am!! 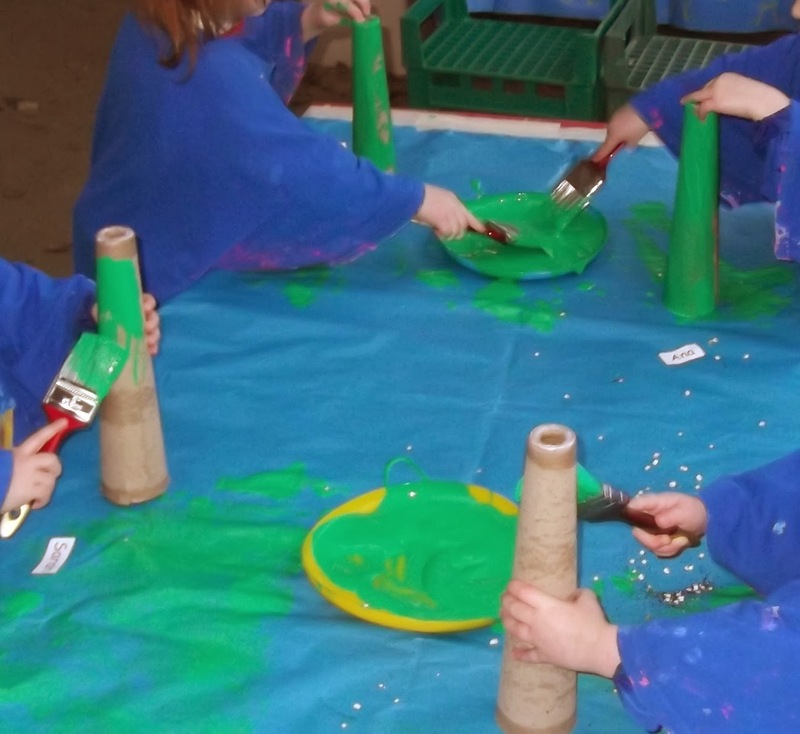 Nursery children are natural optimists, they believe anything is possible & they rarely give up when they can't succeed at a new task. Some days when I am sitting in the block corner or having fun outside I still can't believe my luck. When we are out in the forest or cooking on the fire I have to pinch myself & I know I am so fortunate to do a job I love. Imagine getting paid to make hot chocolate or popcorn? I was walking back from the main school one day a few weeks ago & as I approached the nursery I could hear the children playing before I saw them through the fence. It is, quite possibly the best sound in the world & I get to hear it 5 days a week for 10 months of the year. I do get cross when the early years as a sector is dismissed or worse still it comes attack from those who should know better. 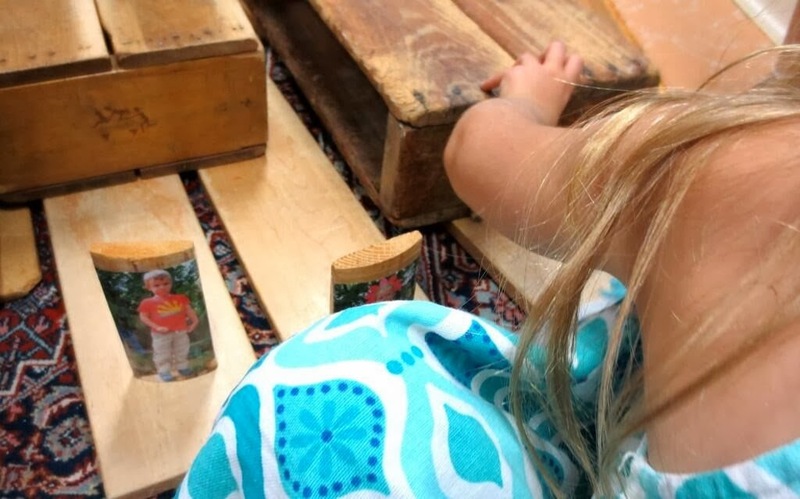 If children can not have a carefree, stimulating playful learning environment when they are 3 or 4 there is something seriously wrong with the world. So I will continue to hold firm against the formalisation of the early years. The children in my class will play with mud, rain, sticks etc., they will have time to watch a snail move slowly across the playground. I make no apologies for not worrying abut whether they recognise all the letters in their name or can hold a pencil 'properly'. They will learn all those skills in primary school & honestly look round a room of adults, do any of them hold a pen 'properly'? 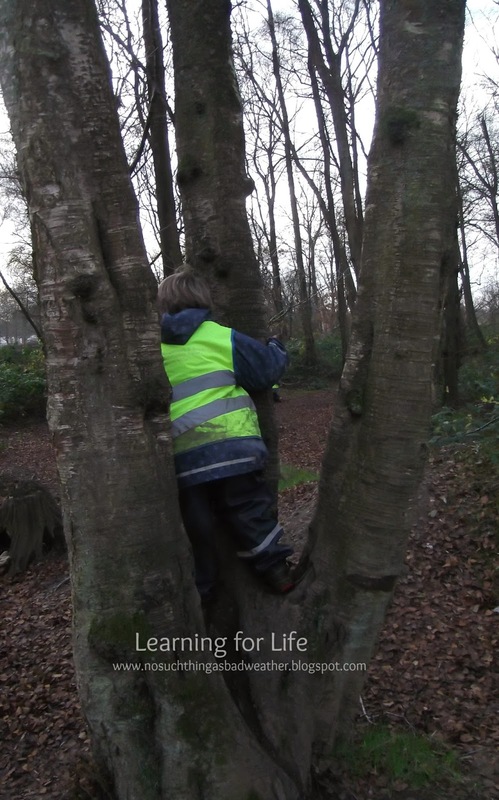 I want the children in my class to have fun, to learn how to take risks, to experience that rush of achievement when they get up the slide or up a tree or put their own coat on. I want them to keep on trying when things aren't going so well & to know that it's OK to not be able to do something - but to never give up on the first try. I also believe that because I have worked in other jobs where I had to work weekends, evening & early mornings & during holiday periods that I fully appreciate how lucky I am to have a steady job that gives me quality time off to relax & recharge my batteries. I truly mean it when I say that if I won the lottery in the morning I would keep on working, as realistically I feel like a lottery winner every day already. I thought I had a good understanding of the true meaning of Christmas, I mean I'm 43 years of age so I know it's not about extravagant gifts or gestures or lavish food etc. 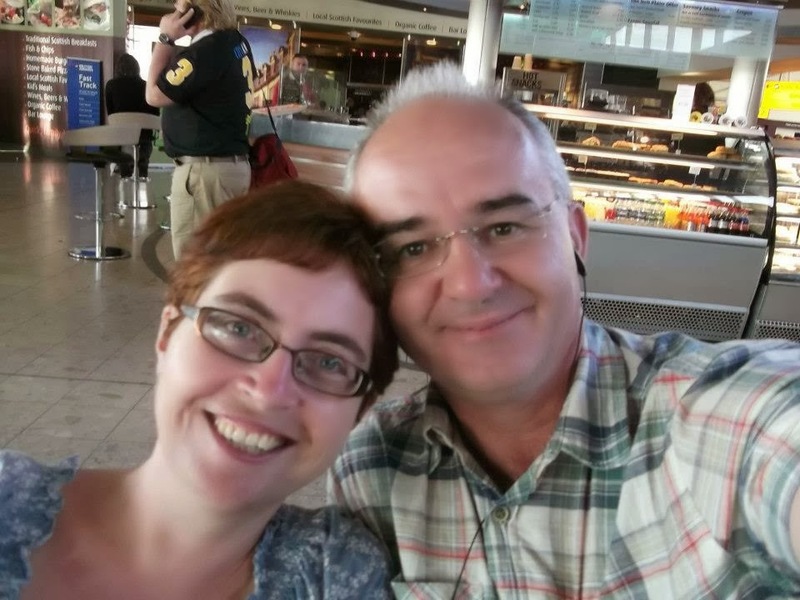 But in recent years it had become about Oliver (my husband) and I going somewhere to have some time away from the whole hustle & bustle that Christmas has become. We usually headed away on the 26th and came back on the 31st or 1st. So I thought that I had learned that Christmas wasn't about rushing around buying gifts & food & buying into the whole 'feel' of Christmas. Oliver & me - together 23 years. Then on the 14th of December our 18 year old niece, Aoife, was involved in an horrific car accident and 10 days later she is still in a medically induced coma in the ICU in the RVH in Belfast. So finally this year I have found out what Christmas is really about - being with family & those you love. 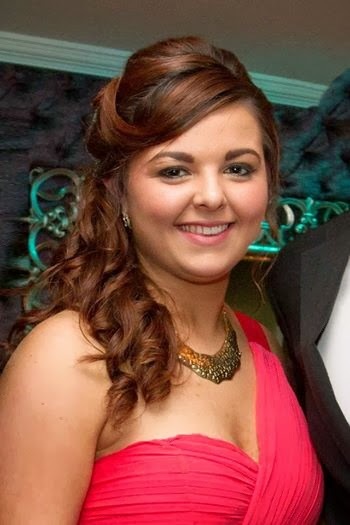 Spending time on Christmas Eve in the ICU with Aoife & her parents, sister & wider family puts it all into perspective. Aoife, at her formal earlier this year, was born a week before our wedding. As my own parents live near the hospital we spent some time with them & my brother, his wife & their 4 girls. I hugged my nieces a little tighter this year as we said goodbye & asked Oliver to take a photo of me & my brother, because as we found out on the 14th of December you just never know what is round the corner. 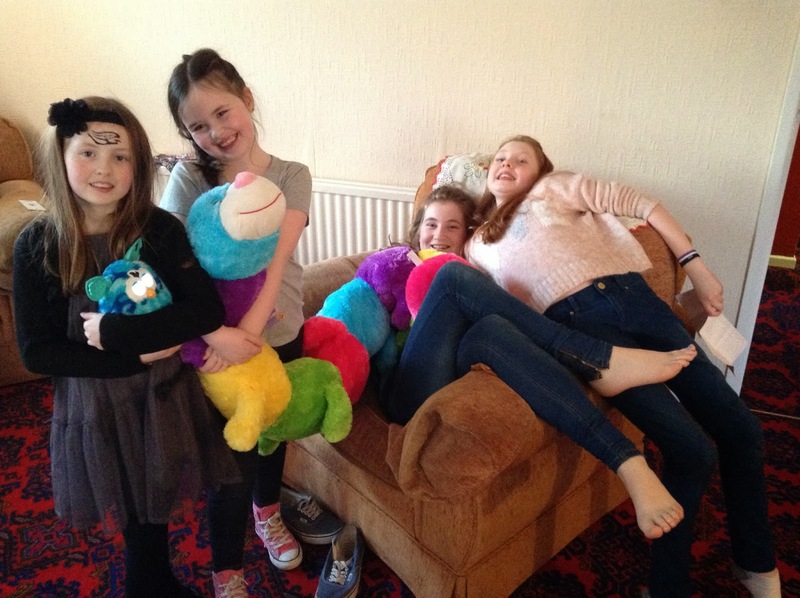 My 4 nieces on Christmas Eve. Me & my big brother, Paul. The strength of support & good wishes that I have had from friends through social media has been overwhelming. It has provided a comfort for Aoife's parents to know so many people around the world care about what is happening to them. 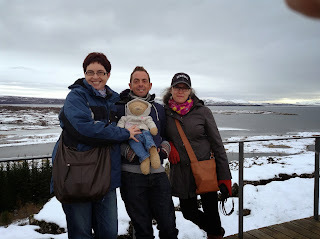 I was so lucky this year to meet up with 2 people who had become good friends of mine online. 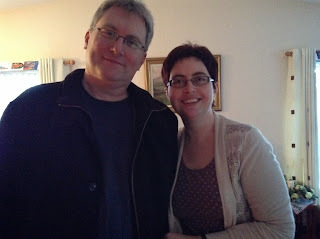 Lesley & I have been chatting weekly via Skype or Google+ for almost 2 years & Martin, Lesley & I have been friends for 6 months or so. Meeting up in person in Iceland in October was amazing, it was brilliant to discover that we got on in real life just as well as we do online. In the past 6 weeks these 2 have been a great source of support to me as I faced, what seemed at the time, a really hard series of events. Now of course everything has been put into perspective by Aoife's accident. But I still really appreciate that Lesley & Martin were there for me & helped to cheer me up when I was feeling a little down. So appreciate those around you & make sure you tell them how much you love them & I ask that if you have some time over the next few days you send some positive thoughts & prayers Aoife's way. Thanks. Welcome to another OPP & the last before Christmas & for 2013. 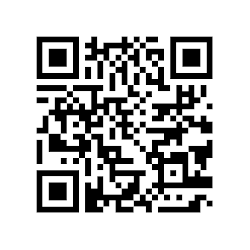 Thanks to everyone who has linked up in 2013, helped me by doing guest posts or taken the time to leave comments. 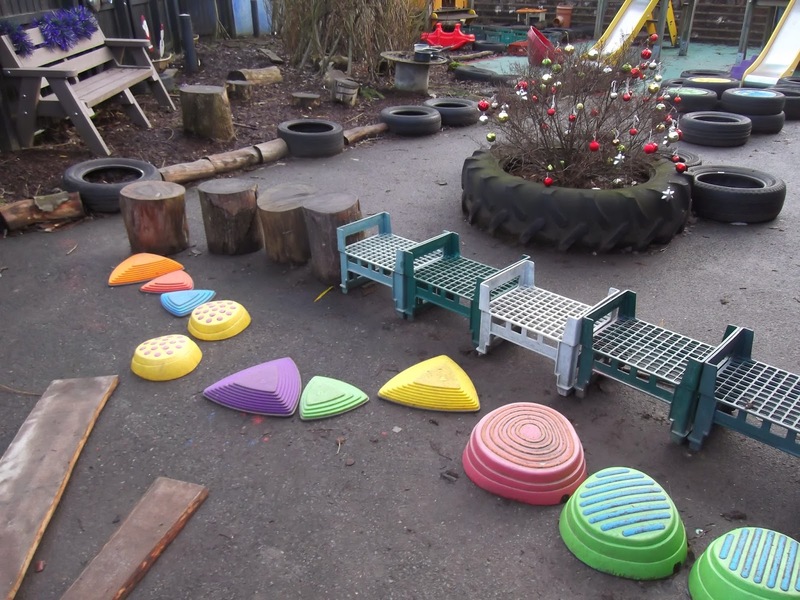 The buzz word at the moment in play is loose parts, it means so many different things to different people but here is my interpretation in an outdoor context. Loose parts can be plastic & natural in my opinion. 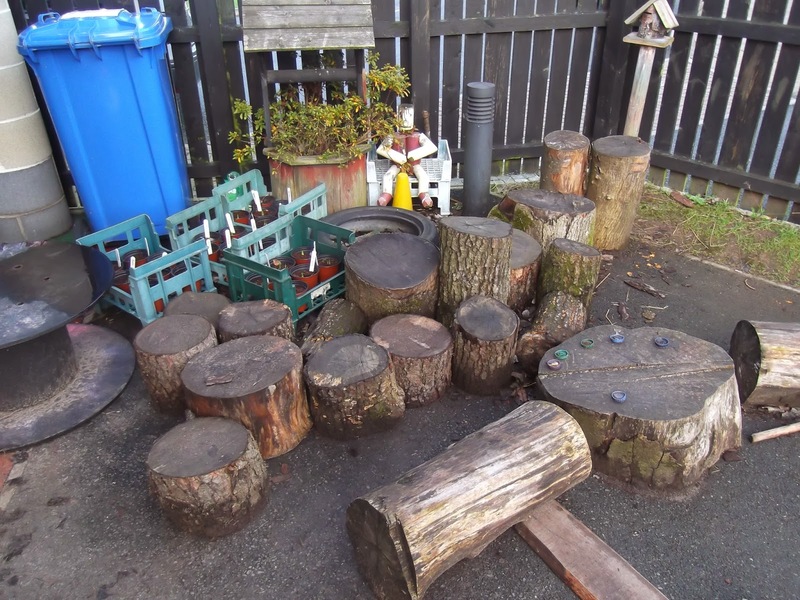 Loose parts are anything that children can move about by themselves or with the help of others, so I count planks, tree stumps & logs as loose parts in my playground mainly because they are moveable. There are lots of fixed things in my playground so it is lovely to be able to provide other resources that can be moved about or become something different depending on where they are. Even with the fixed equipment like the slide, tree house or willow dens they can be whatever the children want them to be - house, rockets, castles, ships etc. but even then the play is mostly enhanced by loose parts like sticks or bottle babies. These are used to create a circle around the fire on Fridays but then are available to be moved about or climbed on during the week. I have one little boy in particular this year who love moving things about, if looking at schemas he would be a perfect example of a transporter. He moves crates, tyres, tree stumps & the plastic stepping stones all over the place. he seems to enjoy the doing of it all more than an end result as he often creates amazing obstacle courses but never really gets too involved in playing on them himself. He seems to enjoy making structures etc. for others to enjoy - though he will be very vocal about where the start is & get very cross if people go the 'wrong way'!! The 'start' was the large red stepping stone going towards the fence. When I look at photos of our playground when we first moved in, it was immaculate but too sterile. 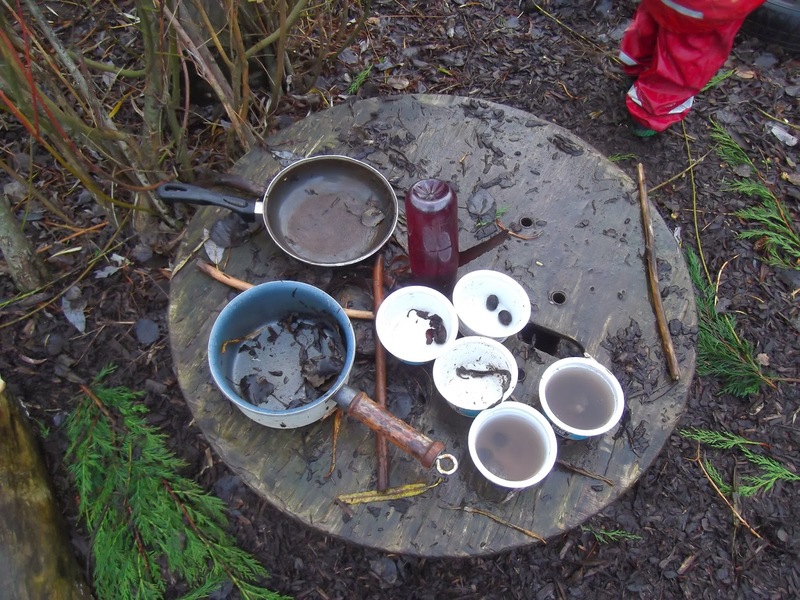 The children really needed lots of manufactured toys & resources to play with whereas now they can be spend hours playing with old saucepans, pine cones, bark chippings & sticks. Hours can be spent 'cooking' with these natural loose parts & the upturned Bottle Baby is seasoning! If I had to give a list of the essential resources for building up a great array of loose parts I would suggest: sticks - long & short, Bottle Babies, pine cones, acorns, hickory nuts (whatever is in your local area), bark chippings or mulch, old sauce pans & water and for larger loose part play, crates, tyres, tree stumps & logs. So as we enter a time when people spend hundreds on manufactured toys for children have a little think about how you can provide hours of fun & encourage imaginative play with lots of 'free' stuff!! 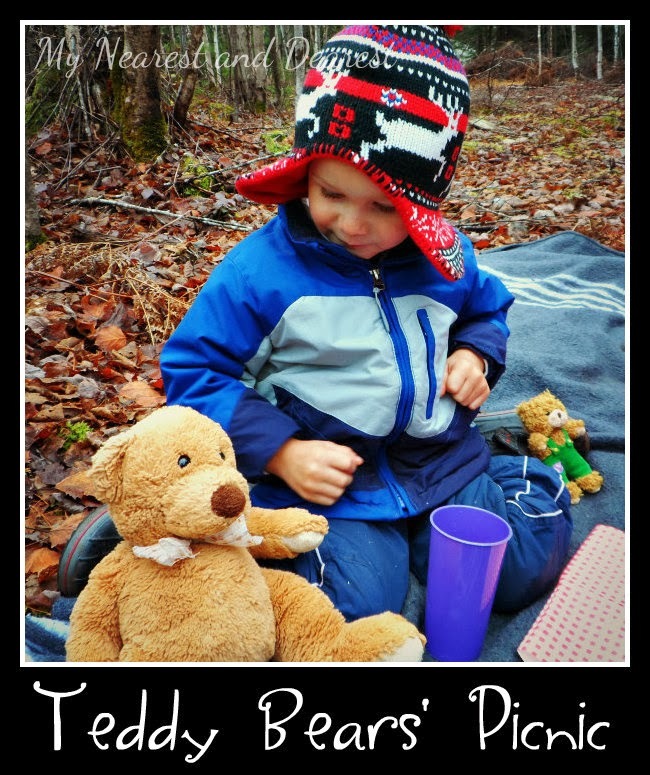 Thanks to everyone to linked up last time & lent support to the OPP, my favourite post that I am featuring from last time was from My Nearest and Dearest on having a Teddy Bears' Picnic, I like the idea of having such a fun event even in Winter as mostly these sort of things seem to only happen in the good weather. Back in August when on summer holidays I read a post on ABC Does by Alistair on Mini-mes. I loved the idea & decided this was definitely something I wanted to do with my new class. As they settled in in the month of September I made sure to get a photo of every child. I think the best thing about the Mini-Mes is that every person making them will have their own version. I got the photos taken in September but only got round to putting them on blocks last week. I had chatted with Lesley from Takoma Park Cooperative Nursery School about this project & she had made hers with off cuts of fence posts. Our caretaker had been going to make me some blocks from off cuts but he was just too busy elsewhere so I decided to use 27 of our Community Playthings unit blocks. I have to say the Mini-Mes have been a big hit, it is so funny to hear the children saying 'Where am I?' 'Have you seen me?' and they refer to them as 'Kierna Block' as if it was a separate person! The Mini-Mes visit the stable to see baby Jesus! 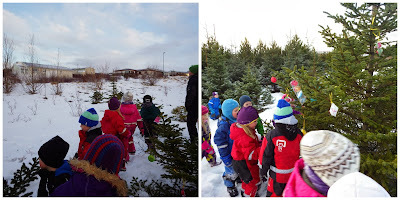 This year the children love to try climbing trees, much more than any other year. So when we go to Peatlands Park or Sperrinview they spend ages walking around seeing which trees are most suitable for climbing. I love to see their sense of pride & achievement when they do manage to get up into a tree & back down again. 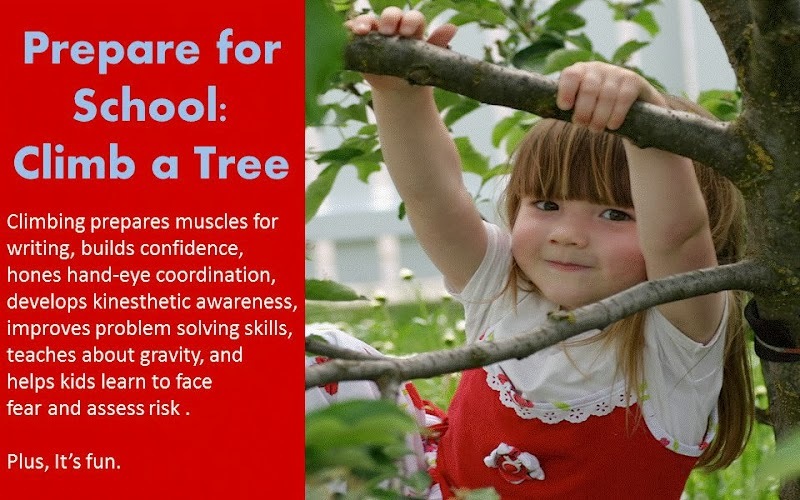 I have this poster from Explorations Early Learning displayed in school & I think it says it all about why tree climbing is such an essential part of preparing for school! Recently I had the opportunity to attend an afternoon training session on Speech & Language Development with other nursery staff in my area. It was facilitated by an ex teacher who now advises schools on how to develop language & writing within schools. She was a very inspiring speaker & her advice was all very practical & doable. The 3 of us from my setting were pleased to realise as we listened that we are doing everything she suggested to help the children in our class develop as competent speakers & hopefully then eventual writers. We ask lots of open ended questions, especially in the 30 minute whole class story time when the children will often be asked to problem solve how a scenario might be reached, for example, How would a tiny goat manage to get up onto a high bridge. Children as young as 3 will come up with amazing suggestions if allowed time to think & to become comfortable at putting forward suggestions. 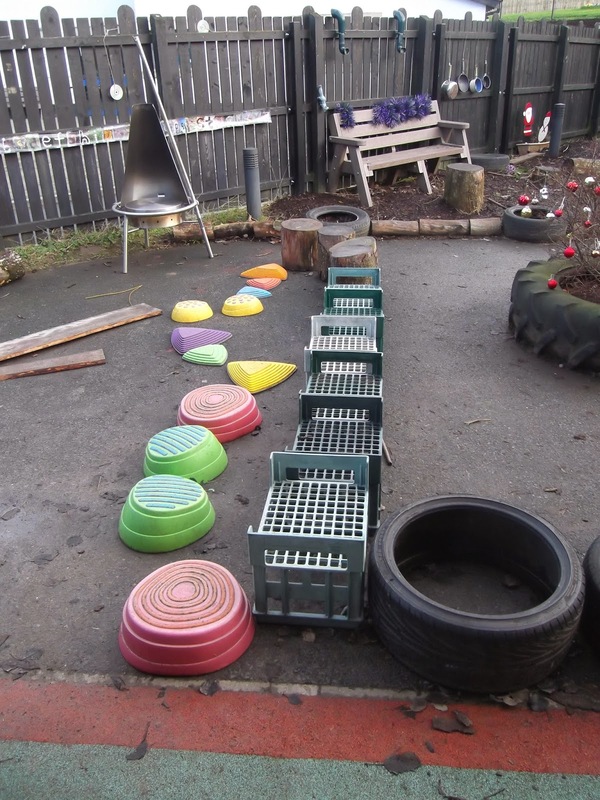 The trainer also lamented the fact that children no longer get to just play outside with open ended resources to help develop their imaginations. Again we could all feel a little smug as we thought of our class spending time outside every day creating their own little worlds using sticks, pine cones & tyres to represent anything from boats to fairy wands. Then she spoke about how the language of school is so different to that of home and how some children will really struggle with this. It really got me thinking, I am quite aware that when a child starts nursery they have to learn a lot of new words & I always stress this on the information night in June before the children start. It is one of the reasons that our settling in time is probably one of the shortest session wise (2 hours) and the longest time wise (4 weeks). There are so many new experiences & vocabulary for the children they need time to absorb it all & adjust. I have been in the same school now for 12 years & therefore I am used to all those words & sometimes it's hard to remember that to the 3 year old child it is all new. We talk about getting a ticket to have snack, let's face it at home you don't need a ticket if you want something to eat & unless the children have come from another child care setting before they start nursery they won't have come across this before. They will hear new phrases like the craft table, loft, block corner, puzzle table etc. We ask them to wear aprons at the water & paint and I bet very few have heard that word before nursery. I remember one year after about a week, I had a group in the story room & was calling them by name & saying 'OK x you can go & play in the classroom' when one little girl asked me, 'What's a classroom?' - we as adults assume too much sometimes! In my setting we talk about rain gear all the time & yet I have had a child ask why we wore reindeer at Windmill once! Teachers also use words & phrases that aren't that familiar to others outside the school environment or is such common use, we need to be very careful we don't bombard parents with words we are used to but will just confuse them. As a teacher of preschool children I talk about fine & gross motor skills all the time but I have to remember to give examples when talking to others outside of the school environment. Schools also love to use acronyms, so it is usual to hear us talk about IEP's, the CoP, SPD, ASD etc. Sometimes it takes someone asking what does that mean to make me realise I am using 'school speak'. I was talking about siblings one day when someone asked me what it meant & I realised it's not a term in common use outside of application criteria for schools. 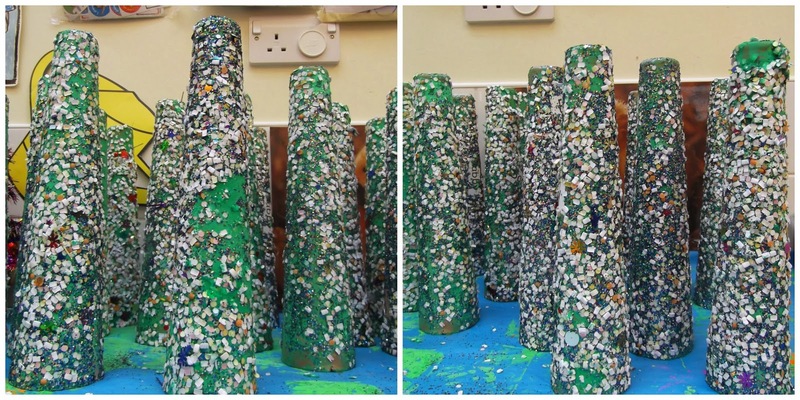 But every so often some phrases pass into common language & I think that the internet & social media has a lot to do with this - a key example would be loose parts. 3 years ago I would have had no clue what this meant & yet now I seem to see & hear it everywhere. 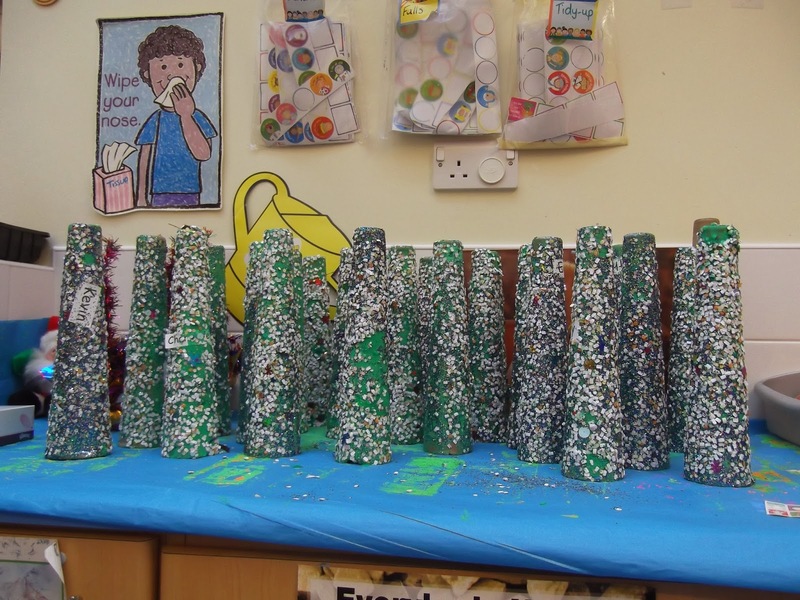 When the children have made these & they are sitting around in the classroom it really starts to feel Christmassy! The children then have to shake the box up & down & from side to side & I always love to see their faces when the lid gets open & they have a sparkly tree instead of just a plain green one. Of course they will go home & take pride of place in their houses but apologies first for all the glitter that will be in the car!! 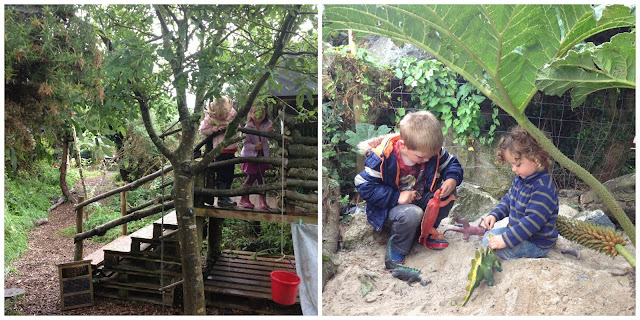 For this fortnightly OPP I'm delighted to have Martin Besford from Highway Farm Activity Centre contributing a guest post & providing images of his amazing outdoor preschool in Redruth in Cornwall. Martin & I became friends via Facebook & then were fortunate enough to meet up in person during the #PlayIceland 2013 conference organised by Fafu . 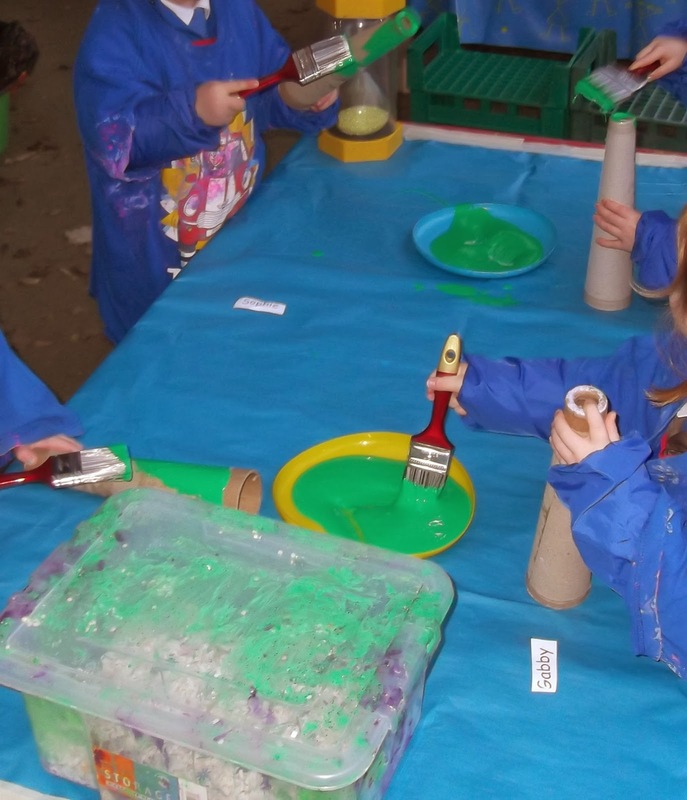 Whilst Highway Farm Activity Centre has been on the site for over 10 years the outdoor pre-school only started in January 2011. As Martin explains it was "Started due to parents demands that children loved coming in the holidays and being outside all day and our ethos. We had the staff experience and qualifications to do it." It was also the type of pre-school experience that Martin & his wife wanted for their own 2 children. he then adds, "We operate in an Eco friendly Timber building with a back to basics, cosy atmosphere. The building is heated by a log burner and water heated on it. We have a compost toilet and are wrapped internally with carbon zero insulation. We try to offer the best of both worlds with a secure natural indoor space, a stimulating and challenging outdoor, enclosed area for free flow. All surrounded by an acre and a half field for the freedom and exhilaration the natural outdoors has to offer." 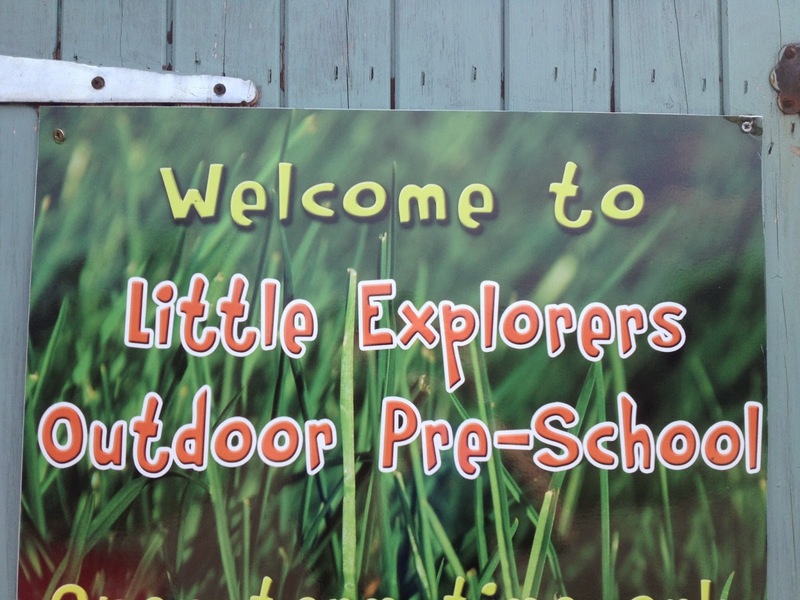 The preschool sessions - known as Little Explorers - run from 8-1 and 15 of those hours are free through government funding. However the setting also runs sessions from 1-3.30 and an after schools session until 6. It is quite possible for some children to attend from 8-6 & the setting is open all year round. They take children from 3 years old until they start school and offer the free entitlement funding from the term after a child is 3. They base their EYFS curriculum around the outdoors and nature and are outdoors in all weathers for the majority of the day.They have also fully adopted the Healthy Early Years Program within our setting and believe these opportunities give children flexible ways of working with and in nature to develop and learn. 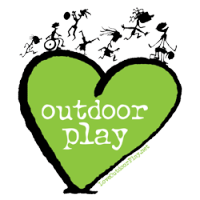 They support and encourage children through outdoor learning to develop their emotional confidence and self esteem. 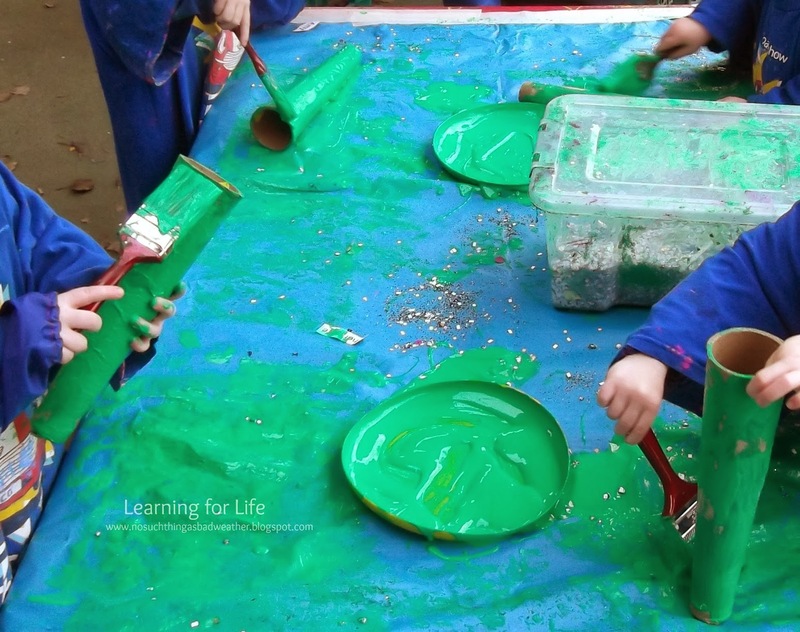 Children are also supported and encouraged to manage their own risks and to develop their life skills through using the correct tools for a purpose. 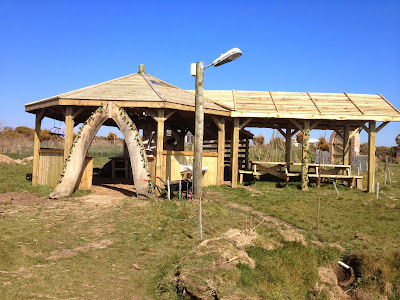 As the farm is run as a community interest group it can now access funding and was successful in a bid to Awards for All for lottery money to build an outdoor kitchen. 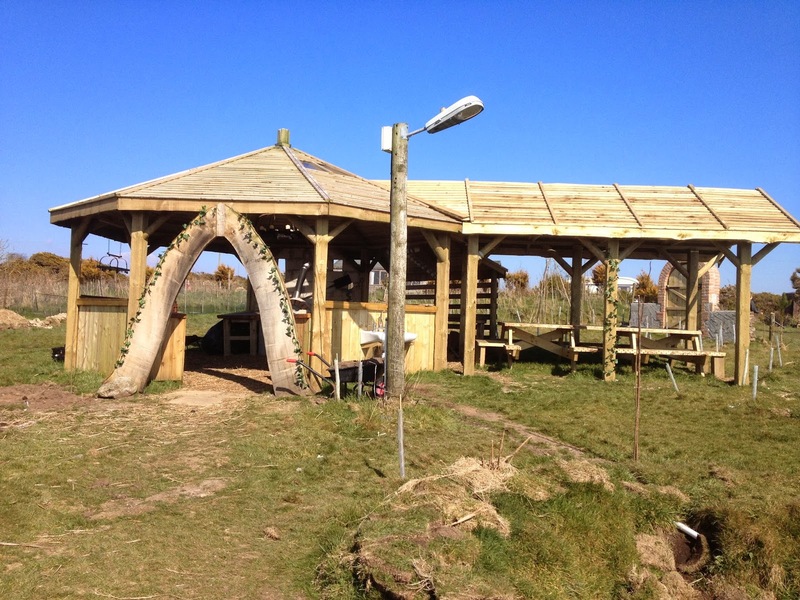 This amazing space means that the children eat outside every day but not out in the elements. I love the way the whole site seems to be in constant development & new pieces are being added to all the time. It means that there are so many different areas on the site for the children to explore & grown into. The amazing outdoor kitchen area. 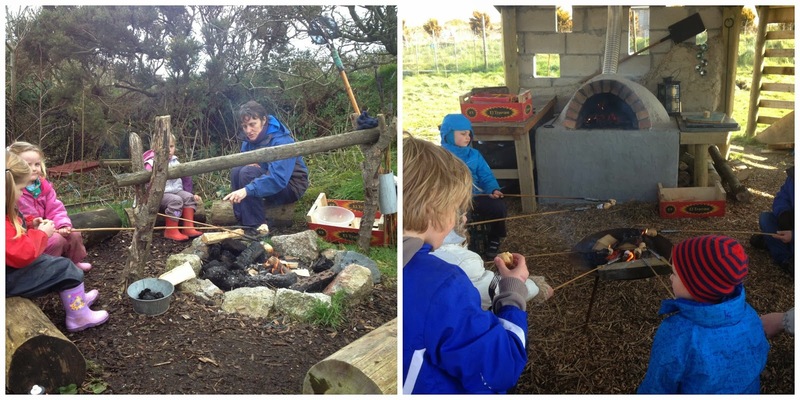 There seems to be an amazing family feel to the whole organisation & they organise between 6-8 family days throughout the year when all family members are more than welcome to come along & join in & even learn some new skills, like how to cook pizza in their fabulous pizza oven. 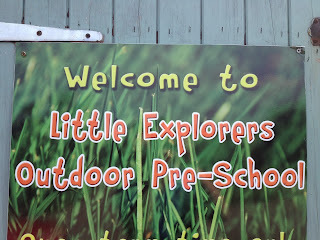 I can see why so many of the children who have attended Little Explorers come back every summer when they start school as it means they get to revisit so many of their favourite activities e.g. cooking marshmallows on the fire and whittling. 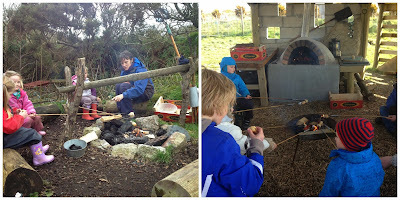 "A typical day is spent collecting the eggs from the chickens, feeding and caring for the rabbits, cooking snack over the camp fire, building dens to story tell in and children initiating their own play and learning. 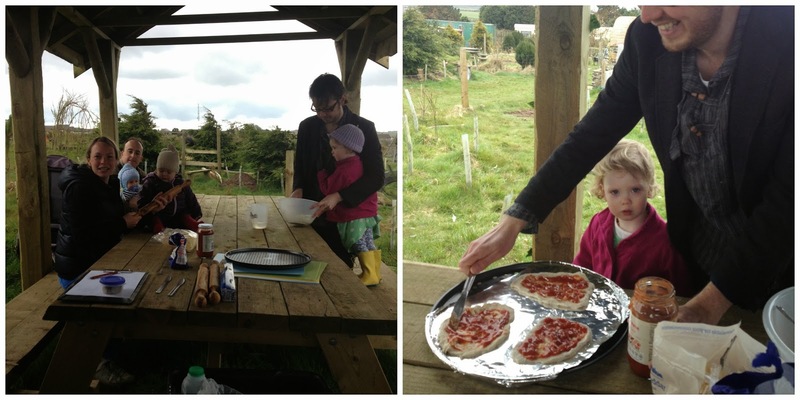 The children tend to the fruit and vegetables they grow on site and ensure they are watered and nurtured, ready for them to select and prepare for their snack. 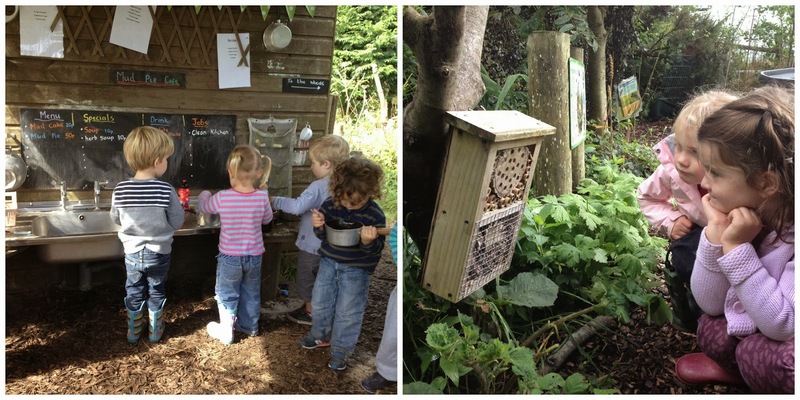 Opportunities are presented through the outdoors in a range of purposeful contexts for children to appreciate and respect nature. Most of our resources are from natural materials found in the local environment. We plant, nurture, harvest and eat vegetables and fruit and incorporate physical opportunities into every day activities." 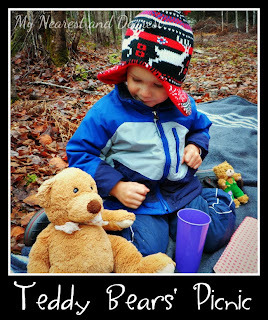 - now doesn't that sound like the most idyllic way for any 3 -4 year olds to spend the day? 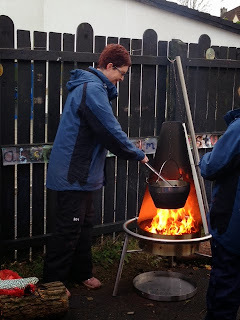 I have visited 2 outdoor preschools now, one in Scotland & one in Donegal, Ireland and I now hope to go over in July and spend some time at Little Explorers and Highway Farm to see what ideas & tips I can bring back to my setting. I am also excited to have Martin coming over to visit my setting early next year, I may just kidnap him until he builds me an outdoor shelter for Bear Woods!! There were again so many great posts linked up in the last OPP and it was great to see summer posts from Australia mixed in with Wintery ones from over here. 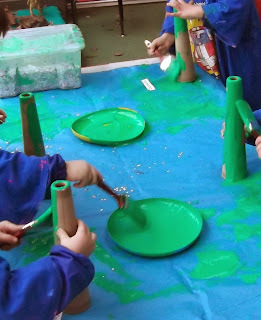 But as a nursery teacher the one that I loved the most was on an urban beach visit from Creative Star Learning Company.